We’re in the second week of our new series at North Ridge, “Man School”. We started out rather poetically, introducing the study of what manhood really entails on Father’s Day. 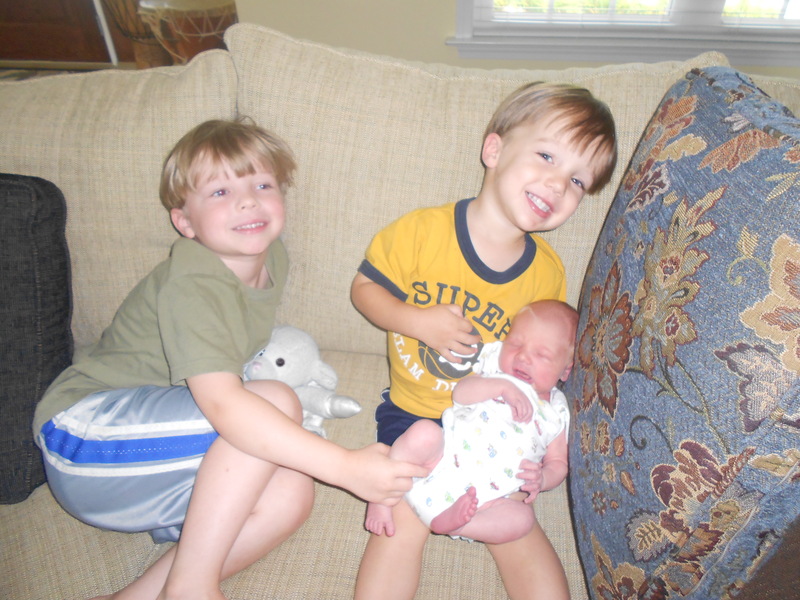 I missed the first message with my own ironic twist, my wife and I welcomed home our third child, a boy, the day before. “Man School” started on Father’s Day with my becoming a father for the third time, making me ‘Dad’ to three boys. To add icing on the cake, before leaving for the Ridge this morning, I helped my oldest construct a light saber out of a 1″ dowel rod and a conduit coupler! (insert a hearty Tim Allen man grunt here) Upon meeting his new brother, Noah (5) promoted our two-year old, Jacob to a “Padawan”, day old Micah took Jacob’s place as the “Youngling”, meaning Noah is now a “Jedi Knight”. (For those of you whose children are not Star Wars fanatics, those are the introductory ranks to become a Jedi Master) Like any good Jedi, Noah had to build his own lightsaber. The local Army/Navy Surplus store does not carry lightsaber parts (to Noah’s disappointment), so I convinced him a wooden dowel with some electrical components would be sufficient. Noah earned the 10″ dowel rod with the coupler, because it looks most like Luke Skywalker’s, Jacob saber is just another 10″ dowel segment, because “he’s just in training”. I love my boys! I realized during the sermon this morning, Dean’s quote led directly into week two’s message. The focus of today’s message was a man’s responsibility in his family, some men embrace their place in the home well, others not so much. The atmosphere within the home depends on the man’s involvement, and the level at which he is involved is clear in the mannerism of the family. Absentee fathers and husbands is a plague eating away at the cornerstone of our nation, the only remedy is men deciding to once again be men. Absenteeism is not only a physical problem, a man may be physically present in the home, but mentally, emotionally, or influentially absent. 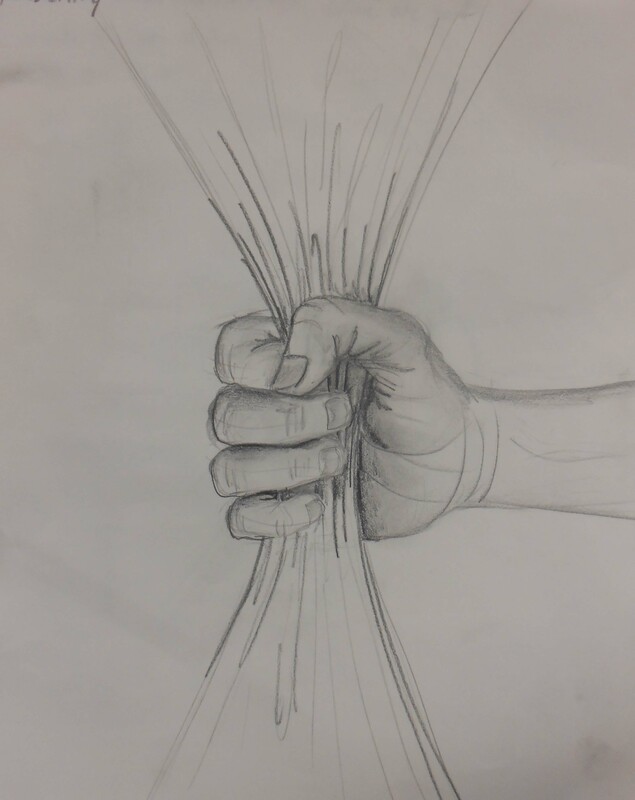 Men need a task to be happy, without something to build, something to grow, a competition to win, an apprentice to train men become bored and disconnect. God gave Adam the mission of cultivating the earth and maximizing its full potential, the epitome of manly-man tasks! Eve’s responsibility? Help Adam fulfill his responsibilities by procreation (be fruitful and multiply Gen. 1:28) and assisting Adam any other way possible to care for the planet. The only specific instruction God gave to both NOT to do is eat fruit from the tree of knowledge (Gen. 2:17). Consuming its fruit would ultimately result in death. Finally, at the end of chapter 2, God officiates the first marriage, presenting Adam and Eve to each other as one creation. We read on in chapter 3 the account of what is known as “the fall”, the commission of the first sin. A talking serpent tickles Eve’s curiosity and convinces her to eat fruit from the tree of knowledge. Countless jokes have spawned from her decision. Eve’s choice sent the world into a tailspin we have yet to recover from; or did she? Yes, she blatantly disobeyed God’s requirement not to eat the fruit from that tree. Where was Adam when the serpent was seducing his wife? Right beside her. Genesis 3:6, Eve took of the tree’s fruit, ate it, and gave some to her husband. There is no pause between eating the fruit and Adam taking a piece, it is immediately consecutive, meaning Adam must has been right beside her. Adam committed the first sin of omission by keeping his mouth shut as his wife was fed the lies that led to her fall. This makes Adam the first absentee husband. Men are leaders of their household, either by their presence or their absence. Some men cave to being the “cool dad” and their lack of disciplined leadership creates chaos. Others go to the opposite extreme and lead as iron fist dictators, making their family cower in submissive fear. Neither are the Biblical model. Men and women are created equal, but different. Dean made a statement today that I will take with me through this adventure called fatherhood, “Men dominate the lives of their families, for good or evil.”Equally important elements to the success of creation, different roles in creating that success. Today’s Man School lesson, be involved, influence positively, lead boldly. Be there. 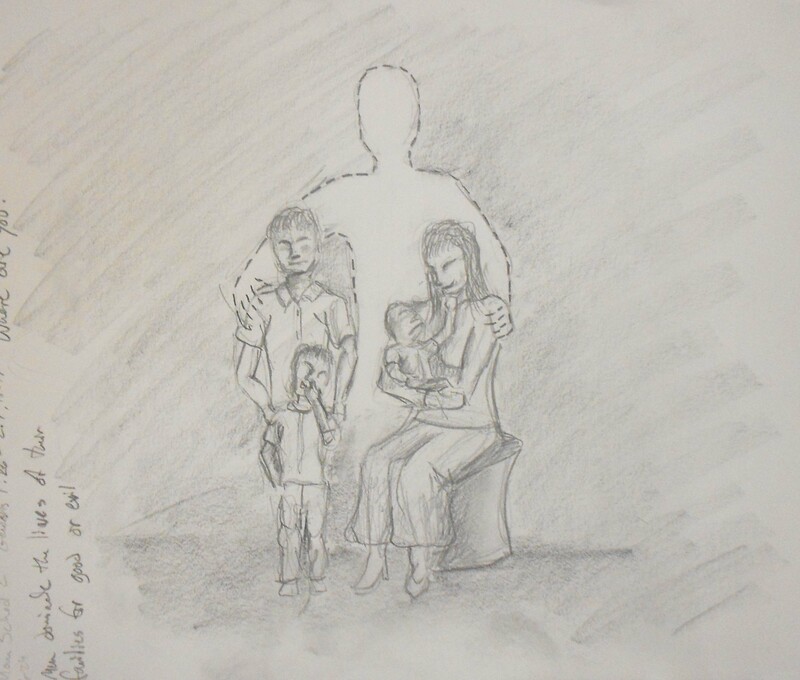 I have titled today’s drawing “Where Are You?”, a question the image poses to every father. The drawing is a universal family portrait. It is a family of three, the youngest child a baby, to reflect my family and remind myself of my place in the day’s lesson. The mother and children are shaded with details as if the drawing is the beginning of a commissioned family portrait. The father, however, is an empty space surrounded by dashed lines. One could read this like a cut-out template for a paper doll or the outlined space waiting for a sticker in a children’s puzzle magazine. Either way, the family is incomplete with the father figure being a gaping hole, desperate to be filled. With that haunting of emptiness, I pose the question to you father’s, where are you? Me? I’m writing today’s post on a laptop in my La-Z-Boy recliner, typing with one hand, supporting a one-week old with the other, encouraging the older two to clean up their toys in the play room (it works sometimes), then on to the kitchen to prepare supper so Julie can relax on the couch and read a book before tonight’s cycle of feeding, diapers, baby rocking, and a day of caring for all three while I work tomorrow. Whoops! I have a diaper to change. See you next week! Be there. Wonderful perspective on Adam and Eve. I had never thought of Adam of being an “absentee husband.” Great insight! It’s wonderful to read about your family too. There are a lot of guys out there who want to be a good dad, but never had a good dad of their own. I hope that they will find your writing and experiences useful. Thank you, John! Dean did an excellent job painting a picture of Eden being presented to Adam and Eve as an example to follow for the rest of the world. It makes sense though, warning them of imminent death from eating the fruit of knowledge couldn’t be very effective unless they had some concept of what ‘death’ was.